The show, which opened on Tuesday, indeed was a bit of that. But it also turned out to be an account of a rare friendship between two very different-yet-similar individuals, in spite of the mutual stereotyping of each other’s life. 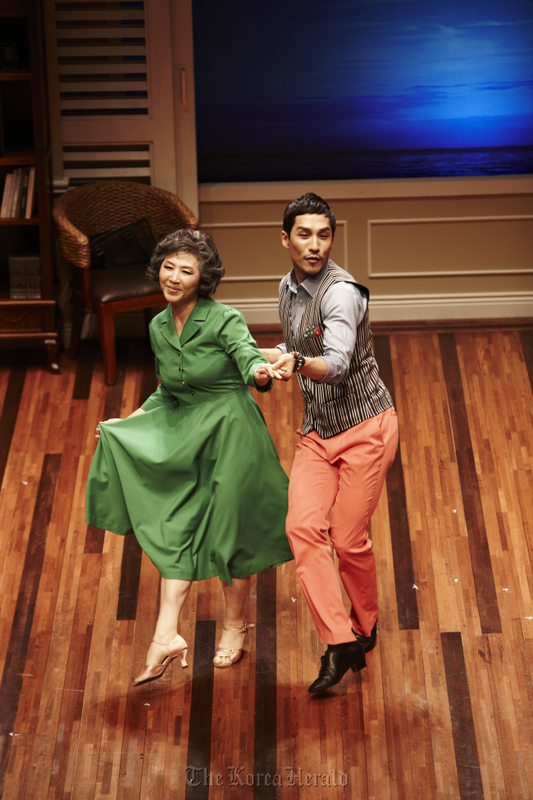 “Dance Lesson” is a Korean adaptation of American playwright Richard Alfieri’s 2001 play of the same title. It begins as past-middle-age Lily Harrington (Go) receives the first visit from her private dance instructor Michael Minetti (Ji Hyun-jun). She has been living alone in an expensive, gulf-front condo in St. Petersburg Beach, Florida, ever since her husband’s death a number of years ago. At first, Lily is flustered by her instructor’s unpredictable nature. He is hot-tempered, peppers his sentences with swear words, and doesn’t seem to have much respect for the elderly. During the second lesson, it is revealed that he is in fact gay. Lily, whose late husband was a Southern Baptist minister, tries to remain cool despite her obvious prejudices. Michael visits Lily once a week, for six weeks. The two dance the swing, tango, waltz, foxtrot, Cha-Cha and contemporary dance while gradually sharing their fears and secrets of their difficult past. Though the two come from very different backgrounds, they also share a lot of similarities. They are both lonely and isolated; while Lily pretends that her husband is alive so she can feel a sense of security, Michael pretends he has a wife to secure his job. It is interesting to see Lily gradually giving up her political correctness as the play progresses. Almost in all of the six lessons, she gets into argument with Michael over all sorts of matters. The repeated arguments, interestingly, make the reserved woman ― who used to work as a school teacher ― honest. She asks him if he has AIDS, offends him by saying his late mother must have died because she was so heartbroken that her son was gay. And it is her political incorrectness that triggers her to understand both Michael and herself better. Her prejudices start to fade as she accepts them and expresses them. This also releases her long-held anger and bitterness ― she ultimately admits her need for companionship. Go’s delivery of Lily was both comical and touching, pulling off the choreography of the show in daring costumes. Award-winning musical actor Lee, whose previous works include “Hamlet” and “Chat on Love,” was sensational as the hot-tempered yet compassionate Michael. In spite of its all- too-predictable ending, the show gives both entertainment and seriousness, delving into the themes of tolerance, reconciliation and death. “Six Dance Lessons in Six Weeks” runs until Sept. 2 at Doosan Art Center in central Seoul. Tickets range from 50,000 won to 70,000 won. For ticket and inquiries, call 1588-0688.